This morning I met my friend Dennis Dunleavy at The Boulevard Cafe to talk about my blog. Dennis has been blogging for quite a while and has been an incredible mentor and an invaluable resource for me. According to Jay DeFoore, editor at American Photo, “Through his blog, The Big Picture, Dennis Dunleavy has emerged as a recognized authority on everything from the use of cell phone cameras in the London subway bombings to the ethics of photo manipulation….His blog posts have attracted a wide international audience, and his writings have been translated into several languages.” I count myself very lucky to have Dennis as a friend and guide on my “blogging” journey. As I was ordering my coffee, I found out that it was the manager’s birthday. Seven weeks ago, it was at this very coffee shop that I met with my friend Debbie and decided to begin this “pie a day” project. I thought, what better reason do I need to make a pie? What kind of pie do you make for someone’s birthday? I considered several options before deciding that Chocolate Cream Pie was the best choice. 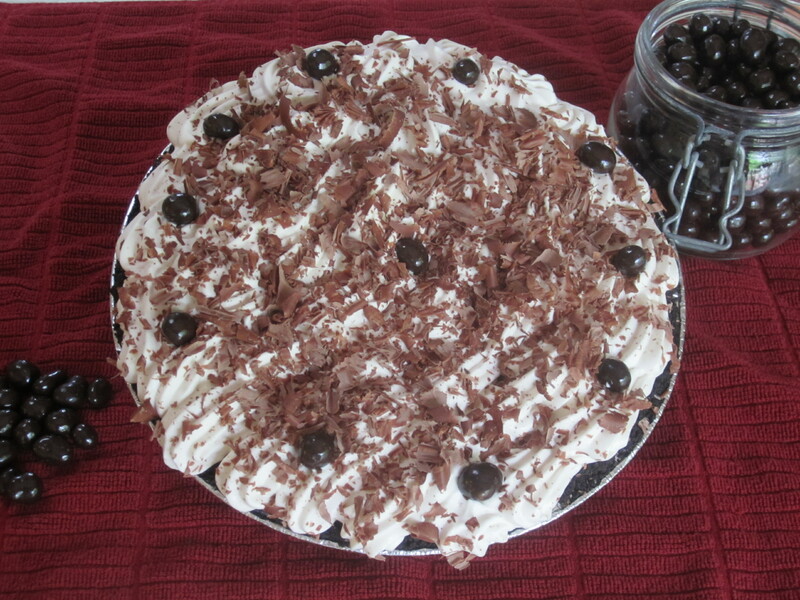 I first made a crust made from crushed Oreo cookies, prepared the dark chocolate filling, and then topped it with whipped cream that had a hint of Kahlua. Rich and creamy and just a bit decadent – the perfect way to begin a new decade! Wow! What a gorgeous looking pie! Jeff is so lucky and your pies are so delicious. It’s hard to imagine the number of calories you already bake and you are just nearly completing 2 or 12 month. Yahoo. Keep up the good work and thanks for the tip of the hat. Well, I was the recipient of this amazing pie for my birthday and let me just say, it was incredible! I literally sat on my couch with the pie in one hand and a fork in the other. It was awesome! Thank you so much for the thoughtful and delicious gift.